Several times a year the ARRL sponsors a VHF contest. This January my brother Kourt KB5PRZ and I decided to participate. 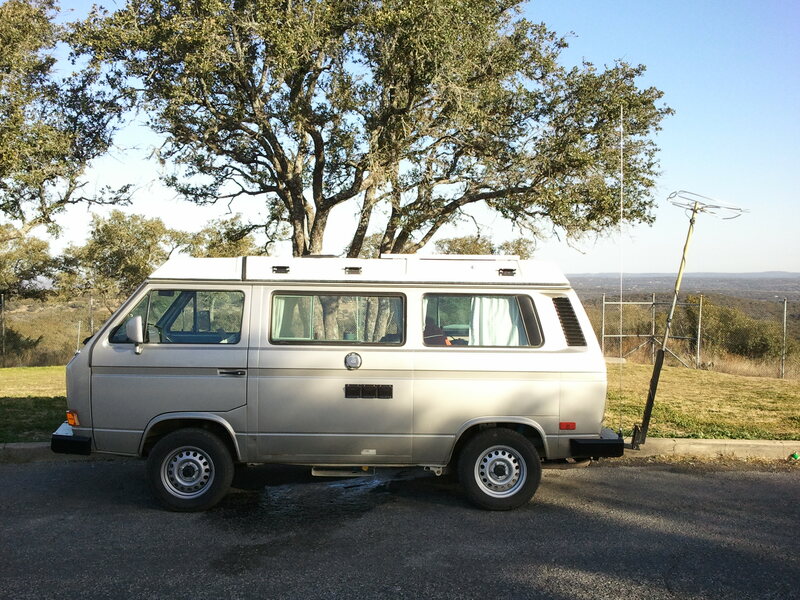 Kourt recently acquired a Volkwagen Westfalia camper van, and we set about equipping it for VHF rover work in the “limited rover” category. Kourt put a great deal of effort into making the van road-worthy, comfortable, and capable of providing power for the radio station. This was its inaugural trip as a mobile radio contesting station. My son came along to learn how it’s done. Our strategy: start in Austin and drive to the high points of four maidenhead grid squares (EM10, EL19, EL09, EM00). The more squares we transmit from, the more points we get. We’d use simple omni antennas while en route, then set up directional antennas once we reached our transmitting points, operating in the 6m, 2m, and 70cm bands SSB voice. In Central Texas, we’re fortunate to have the confluence of four grid squares near Wimberley, TX, as well as many hilltops to from which to operate. We started by working from EM10 at the highest point in Austin. From there, we proceeded to EL19 in San Marcos. Along the way, there was an E-skip opening on 6 meters that enabled us to work Arizona with a 102″ whip. 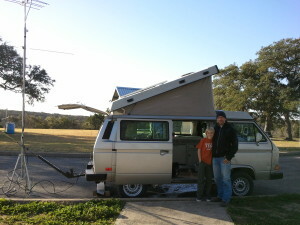 As the sun fell, we proceeded to a roadside park near Fischer, TX in grid square EL09 and set up camp for the night. With all the creature comforts of the Westie, including heat, running water, electricity, solar & battery power, we enjoyed an evening cooking lentil soup and venison sausage, followed by a restful night with the top popped up. Kourt, KB5PRZ, gives a more detailed description of the work put into the van on the Samba forum. As the sun rose, we were treated to a fine panoramic view of the Devil’s Backbone. Morning is a great time to take advantage of tropospheric ducting on VHF bands. With the weather being warmer than usual, the chances were good. With our directional antennas we were able to reach as far as the Louisiana border on two meters and Florida on six meters. Satisfied with the morning’s results, we packed up camp and moved on to grid square EM00 on a high ridge between Blanco and Henly. It was the highest point of our trip. From there we continued to work stations as far as the DFW area, Toledo Bend, and Rocksprings. Sunrise at the roadside park, Devil’s Backbone. Given our budget and a general desire to do more with less, we were pleased with the performance of the station. More importantly, we had a chance to enjoy a beautiful weekend in the country. It wouldn’t matter much if we had no contacts at all; the Westie was a blast to camp in, and Kourt makes the van very much like a tiny home. We were entertained by the many double-takes as passers-by looked, waved, and wondered what we were doing. We look forward to more contests in the future. Listen live to Austin area amateur repeaters and Travis County and Austin police radio. These feeds run 24/7. The amateur radio feed scans through all known operational 6m, 2m, 1.25m, 70cm & 33cm repeaters in Austin, Williamson, Bastrop, and Hays counties in central Texas. 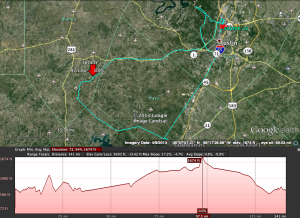 The law enforcement feed scans police departments, sheriff and constables for: Austin Police, Travis County, Lakeway, Manor, Pflugerville, Westlake Hills, Rollingwood, Sunset Valley, UT, and Texas DPS. – At Broadcastify here. If you use the Scanner Radio mobile app, it’s like having your own pocket scanner. 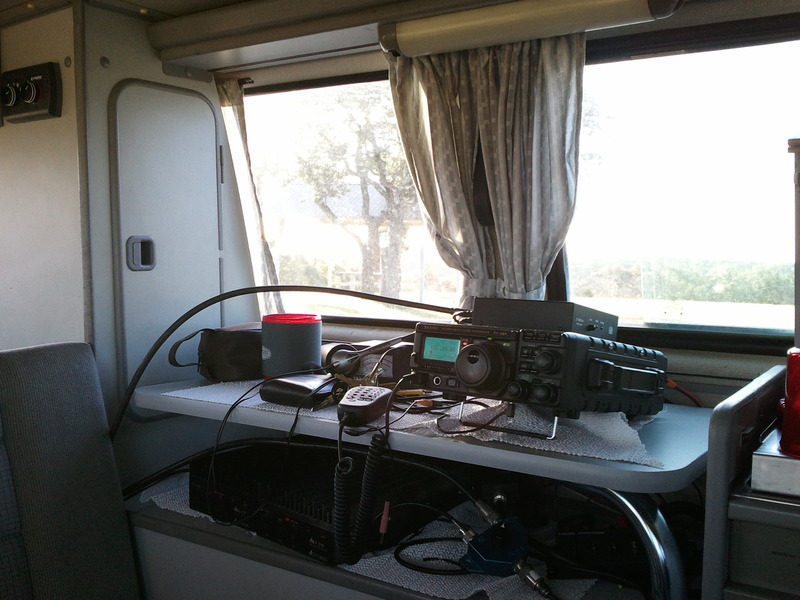 The archives for the Austin amateur radio feed can be found here. Recordings are kept for six months. You can listen to both of these feeds simultaneously on this page. I keep a library of programming files for various radios I own. Considerable effort has gone into curating these and it makes sense to share them. The links below are permanent and will remain fresh as I continue to update them from time to time. Yaesu FT-8800R CSV: This is a CSV export that is suitable for import to most radios and programming software. It contains all operational repeaters for Travis and continguous counties in central Texas, plus many repeaters that cover major routes between Austin and the metro areas of San Antonio, Houston, Corpus Christi, Big Bend, Dallas, Ft. Worth, Lubbock, and Midland. It also contains several commercial and government frequencies, important channels in the Austin aircraft band, NOAA, FRS/GMRS, MURS, Austin Rail, and more. Yaesu FT-8800R RT Systems: This is the same as above, except in the proprietary RT Systems format. 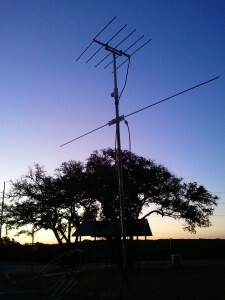 Yaesu FT-897D RT Systems: This is the RT Systems format file that contains all central Texas 2M & 70cm repeaters, plus wide coverage repeaters in major Texas metro areas, plus most operational six meter repeaters, plus some 10 meter repeaters in TX, NC, and NY. 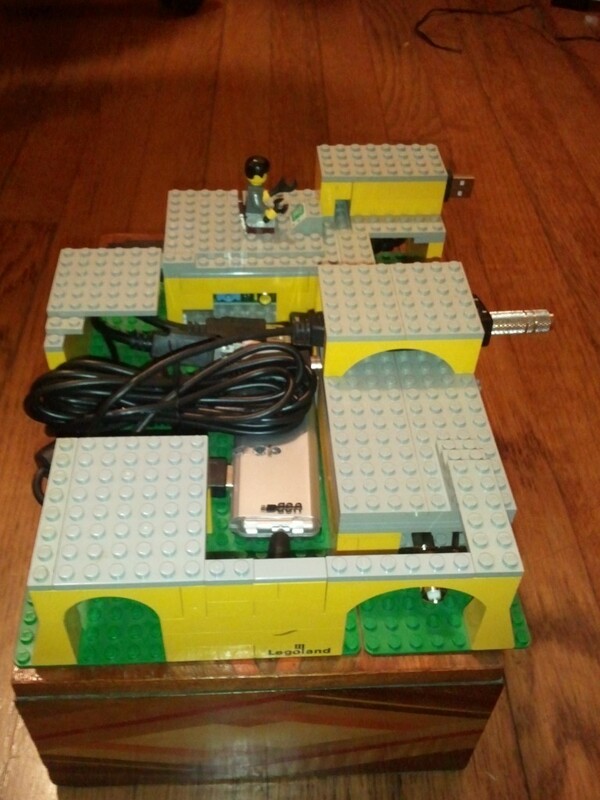 This also works with the FT-857D. Yaesu FT-857D CSV: same as above, in CSV format. Yaesu FT-7800R Chirp image: This is largely the same content as the FT-8800 RT Systems file, but in the CHIRP format for the FT-7800R. Yaesu FT-60R RT Systems: This is a subset of the FT-8800R RT Systems file, but for the FT-60R HT. Yaesu FT-50R RT Systems: This is a subset of the FT-60R RT Systems file, but for the FT-50R HT. You can expect these to remain fresh as new updates arrive. I’ll post in the comment section of this post when updates occur. As attested by these onlookers at my backyard station. 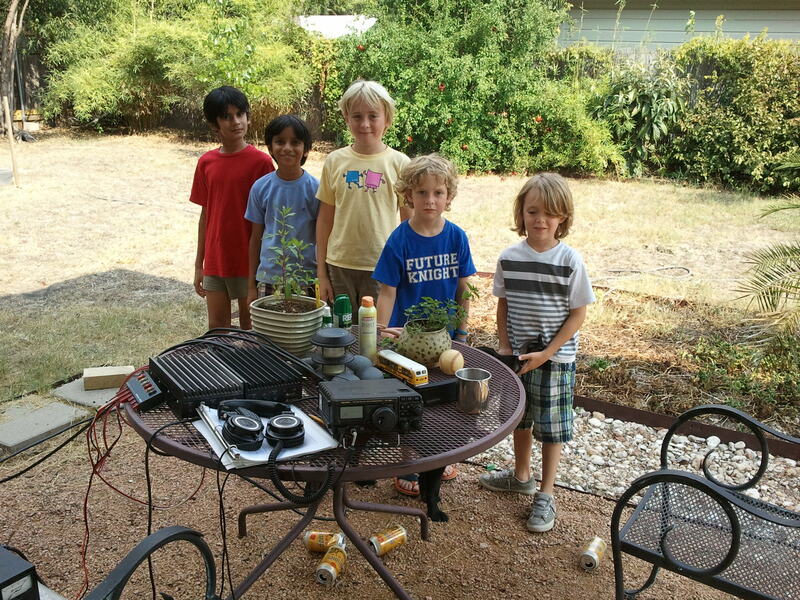 Children playing hide and seek pause to inspect my amateur radio station. – the companion mobile app makes it easy to find repeaters in new areas, even more so if combined with the BlueCAT interface. The result is that I can personally verify the operation of local repeaters, update the database at RepeaterBook, then run a query to download it into CHIRP. Now in my radio I have all the repeaters that work, and none that don’t. Just as it should be. The benefits of crowd-sourcing a quality repeater directory only work if we all participate. Please do. 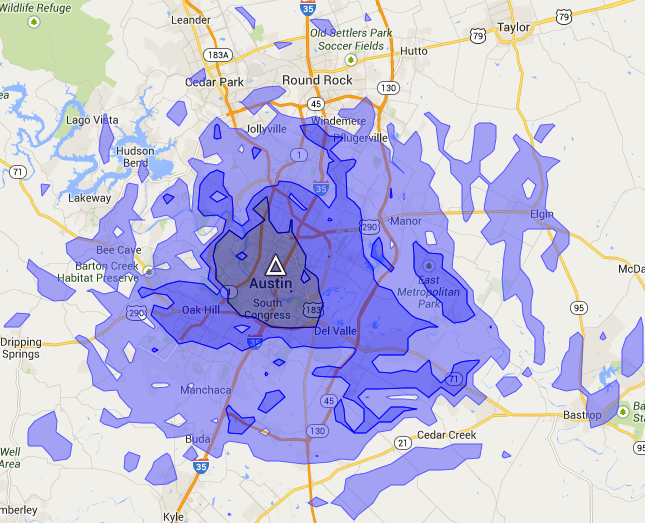 Here’s a Longley-Rice coverage map for the 442.15 repeater in Austin. This was generated by a useful coverage map site.